Tel/Fax +44 1232 742682 or Tel +44 1232 747470. Cover Design by Belfast Litho Printers Ltd.
Graphic Design by Belfast Litho Printers Ltd. Printed by Belfast Litho Printers Ltd.
David Clements; Brendan Bradley; John Millar; Marie McNeice; Hazel McCready; Sandra Peake; Sam Malcolmson; Mike Morrissey and Marie Smyth. 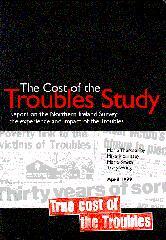 The Cost of the Troubles Study, a group of people bereaved or injured in the Troubles working with academic researchers, have conducted a survey across Northern Ireland. The purpose of the survey was to establish the range of experiences people had of the Troubles, and how their experiences had affected them. those with a low death rate (under 1 per thousand population) - low intensity areas. In-depth interviews with 75 people were conducted in order to provide data on a range of experiences and effects of the Troubles. A questionnaire was designed on the basis of this interview data. A standard health instrument (SF12) was also used in the questionnaire. All of those individuals surveyed were first written to, and given an opportunity to refuse to participate. Publicity about the survey was organised so that the public knew who was doing the survey, and what its purpose was. 30 interviewers administered the questionnaire to 1,346 people from an attempted sample of 3,000 drawn randomly from the electoral registers of 30 wards. Interviewers were trained to give information about support services or make referrals where appropriate when they encountered people in need or distress. Respondents in high intensity areas reported lower incomes, higher occupancy of public sector housing, higher unemployment and more benefit dependency than either of the other two locations. Overall, respondents in high intensity areas reported more experience of the Troubles, followed by those in medium intensity areas. Those in low intensity areas reported least experience overall. However, those in high intensity areas, reported less experience of less extreme experiences, such as seeing news broadcasts related to the Troubles, and about the same level as the other two areas of medium range experiences such as getting stopped at a checkpoint. For all other intense experiences of the Troubles, those in high intensity areas reported levels of experience far in excess of medium and low intensity areas. For example, 28% of those in high intensity areas reported having their home attacked, and 10% reported having their home destroyed. those in high intensity wards also reported more health problems than those in the other two areas. Those using medication in high intensity wards were likely to be using it for sleep disturbance, sedation or anti-depressive purposes, whereas those in low intensity wards used them for pain control rather than for anti-depressive purposes. Who do people hold accountable? Those in the wards least affected tended to blame Loyalist and Republican paramilitaries for the Troubles, whereas those in the wards most affected tended to blame Loyalist but not Republican paramilitaries and the police and army. What is the clearest predictor of need? Differences between areas were analysed via cross-tabulation. Chi-Square was used as a significance test of these differences. Given the very large number of cross-tabulations generated, difference was tested at the .005 level. There is wide variation amongst people in Northern Ireland in terms of both their experience of the Troubles and the effect on them. Above all, location - whether a high, medium or low intensity area is the best predictor of the extent of experience of the Troubles, and of the effect of the Troubles. Males were more likely to report being involved in physical fights whereas females reported more disrupted schooling and more often felt blamed for the Troubles. Catholics in all three locations had more experience of the Troubles and also reported more effects of the Troubles on them. However, of the three key factors - gender, religion and location - the latter was the most important factor. There is a strong pattern of segregation - over a quarter of those from highest intensity wards who were employed, worked only with members of their own community. There is no straightforward relationship between individual experience of the Troubles and effects of the Troubles. Just over half of those with "a lot" of experience of the Troubles indicated some change in their lives, compared to a fifth who said there had been a complete change. An indicator of post-traumatic stress, loosely based on the diagnostic criteria for Post Traumatic Stress Disorder was constructed and 390 cases, about 30% of the entire sample met the criteria. Only small differences were noted between men and women, but large religious differences emerged, with Catholics reporting more stress than Protestants. Similarly, those living in the highest intensity wards reported more stress than those in medium intensity, and those in low intensity reported less stress than either of the other two cohorts. Location and religion stand out as significant factors in both the experience and the effects of the Troubles. Other factors such as segregation and levels of deprivation seem to be related to the level of exposure to Troubles related experiences, and the degree of impact of the Troubles on people’s lives. The concentration of Troubles-related violence in certain location and sub-sets of the population should be recognised by policy makers and service providers, especially in targeting social need. There is a need to learn more about those who have been offering social support to those affected by the Troubles in order to offer support and recognition for work, which has been the major and most effective source of help in this field. Further work is required on the role of prescribed medication and alcohol in the management of Troubles related stress, especially in the light of the poorer overall health reported in the areas worst affected by the Troubles. third there is a strong pattern of segregation - over a quarter of those from highest intensity wards who were employed, worked only with members of their own community. Of the five variables identified as being potentially significant in being associated with both different experiences and effects of the Troubles, location and religion stand out. Indeed these are connected, given the high degree of spatial polarisation in the form of sectarian segregation in Northern Ireland, which is exacerbated in those areas where Troubles-related violence has been most pervasive. As indicated earlier, the sampling procedure was weighted to 'over-represent' those areas where death rates were highest. Unsurprisingly, the most intensive and pervasive experiences of the Troubles occurred here. Nevertheless, like many social phenomena, the pattern of violence in Northern Ireland has been extremely uneven. The analysis of the five variables above suggests the following set of relationships. These factors should be recognised both in developing and delivering compensatory policies as part of any peace settlement. The spatial distribution of the impact of the Troubles, and its particular effects on sub-sections of the population should be part of the considerations of service planners and providers. Moreover, this concentrated experience of violence should figure in the operationalisation of New Targeting Social Need. In certain areas, the experience of violence has been collective and multidimensional (local paramilitaries, paramilitaries from the ‘other side’ and the security forces have all contributed). Consequently, it makes sense to think in terms of spatially targeted programmes both to alleviate the effects and to emphasise the targeting of social and economic reconstruction. Consideration must also be given to the impact of such concentration on local cultures, expectations and attitudes. Community programmes aimed at areas worst affected which assess local need, raise expectations and provide information and support for local problem solving might offer a fruitful beginning for some of these areas. The particular role of families and social support networks in helping those affected by the Troubles, and consideration should be given to how this can best be supported and recognised. Clearly, most people do not seek professional help for the effects of the Troubles on them, and of those who have had help, the majority report immediate family as its best and most accessible source. Beyond the immediate family, the importance of the voluntary and community sector, and general practitioners in the provision of help from outside the family also emerges from the findings of this study. The prevalence of the use of alcohol and prescribed medication as means of coping with the Troubles, particularly amongst those worst affected also emerges, and an examination of alternatives to the use of drugs and alcohol might be a fruitful avenue for exploration by service providers. This survey, was part of a larger study aimed at elucidating the experience and effects of the Troubles on people in Northern Ireland. We hope it provides a useful base-line and starting point for other work in this field. We are aware of a numbre of areas for further exploration. Although we embedded a standard health measure (SF12) in the questionnaire, we have completed only a preliminary analysis of this here, due to difficulties in finding scores for the population for analysis purposes. In some ways we regret the choice of this instrument, since it has not been widely used (or used at all) in Northern Ireland, thus rendering our task of analysis more difficult. However, we will publish further analysis on this issue in future papers. A second regret is that, in the process of editing the questionnaire, some of the questions designed to reflect the diagnostic criteria of the DSM-IV became edited and some were omitted altogether, requiring us to use less exact questions in the constructing of our Stress Indicator. Finally, the survey has relied on interviewees reporting their memories of their experiences of the Troubles and their own assessment of the impact on them. The issue of the reliability of memory, and the issue of denial, which has been widely used in Northern Ireland and elsewhere as a coping mechanism in times of barely tolerable stress is also worth mentioning. This survey can only report on what respondents remember, and what they do not now deny. Perhaps assessing the experience and the impact of events as terrible as armed conflict must always be an exercise in sailing among icebergs, where the danger of collision with what is not perceived makes us constantly nervous of shipwreck. We present this study with due nervousness, in the hope that it offers some useful insights and points of departure for our own and others’ further work. Bell, P., Kee, C., Loughrey, R., Roddy, R.J., and Curran, P.S. (1988) "Post Traumatic Stress in Northern Ireland." Acta Psychiatr. Scand. 77: 166-169. Curran, P.S., Bell, P., Murray, A., Roddy, R., and Rocke, L.C. (1990) "Psychological Consequences of the Enniskillen Bombing." British Journal of Psychiatry: 156: 479-482. Diagnostic and Statistical Manual of the American Psychiatric Association. Fourth edition. Fay, M.T., Morrissey, M., and Smyth, M. (1998) Northern Ireland’s Troubles: The Human Costs. London: Pluto. Fraser, R.M., (1971) "The Cost of Commotion: An Analysis of the Psychiatric Sequelae of the 1969 Belfast Riots." Brit. J. Psychiat. (1971) 11, 237-64. Fraser, R.M., Overy, R. Russell, J. Dunlap, R. and Bourne R. (1972) "Children and Conflict." Community Forum No 2 1972. Belfast: Community Relations Commission. Lyons, H.A. ( 1974) "Terrorists’ Bombing and the Psychological Sequelae." Journal of the Irish Medical Association. January 12, 1974. Vol 67, No 1. Sutton, NI. (1994) An Index of Deaths from the Conflict in Ireland 1969-1993. Belfast: Beyond the Pale. World Health Organisarion: International Classification of Diseases: Tenth edition.